Today China has a population of 1,368,580,000 (March 7, 2015) and the focus is on making money and be satisfied - mercilessly, in every way. There are major social and economic gaps in China - but everyone wants to get rich, or richer - a society under development with a peculiar mix 'of multinational-led capitalism under communist rule. China has about 600 billionaires and 2,378,000 millionaires. China's newly rich, requires a lot of everything - immediately. A previously oppressed country (45 million Chinese died between 1958 and 1961 mostly from starvation) now wasting money on everything from seven course dinners with shark fen soup on the menu - to buy up all the wine in Europa. Life smiles, at present, for many people in China - but not for the animals. David Roach, Warwick Ross, 2013, Australia, FilmBuff USA Russell Crowe narrates this intoxicating documentary about the world-famous winemakers of Bordeaux, and how the rapidly expanding Chinese market for the legendary vintage is irreparably changing the nature of the French wine industry. China’s politics of reform offer us a better explanation for the nation’s animal welfare crisis. Since 1978, China has seen a nation-wide drive for prosperity and, more than 500 million Chinese have been lifted out of poverty. But there remains a collective fear of hunger in the minds of people over the age of 50 in China. And, this fear has a regime stability connotation to the Chinese Communist leaders. Deng Xiaoping, China’s reform architect, once remarked that people would revolt if the food security situation could not be improved. So Chinese reforms, initially, were intended to improve the food supply to the (then) 900 million Chinese people, while ethics, morality, social responsibility, environmental impact, labor rights, etc., were often ignored. Chinese authorities are not motivated to tackle the problem of animal cruelty for fear that economic growth would be slowed down. Again, that could be interpreted as leading to a regime stability crisis. You referenced pigs. Since meat consumption is so counter possible vicissitudes in pork supplies on the market. This also explains why China does not have animal welfare laws or anti-cruelty laws. For decades, researchers and policymakers have raised a worrying question about the world's most populous country: "Who will feed China?" Today, while concern about reaching 1.3 billion mouths remains paramount, the phrasing has changed slightly: "Who will feed China's pigs? "China's phenomenal economic growth has lifted millions of Chinese out of the hardscrabble rural poverty that was a central feature of the Mao Zedong era. The country is now not only "factory to the world," but also the world's largest producer and consumer of agricultural products-particularly meat. In the past ten years, consumption of pork, China's most popular meat, has doubled. 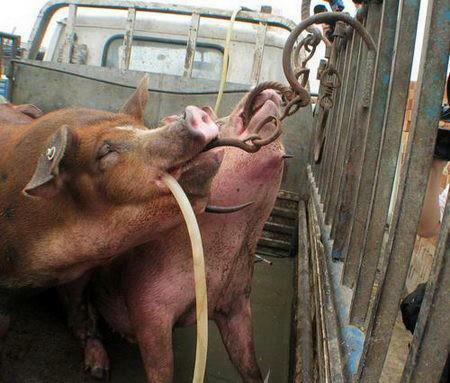 China has surpassed the United States as the world's top pork producer, raising and slaughtering 700 million pigs a year. It also tops the United States in meat chicken production and has a farmed animal population in the tens of billions. Western-style meat culture has gone mainstream. In the past, "children looked forward to the spring festival, partly because it was fun, but also because it was a chance to eat meat," Zhang Xiuwen, a farmer-turned-tennis coach in Beijing, told a UK newspaper recently. "But," he continued, "now we can eat meat every day if we want. It has become part of our lives." ﻿Fast food is now a $28-billion-a-year business in China. McDonald's, a major sponsor of the Beijing Olympics, has nearly 1,000 restaurants nationwide, including four that operated at Olympic venues alone, serving athletes, spectators, and the press. China's government has opened the doors to investments by major multinational meat and dairy producers and animal feed corporations, including Tyson Foods, Smithfield Farms, and Novus International. But with every fifth person in the world a Chinese, even small increases in individual meat and dairy consumption will have broad environmental, climate, health, and food security impacts. What China eats, and how it produces its food, affects not just the country, but the world. And while China is not yet a bona fide "factory-farm nation" like the United States, the strains of its fast-growing livestock sector are becoming harder to ignore. China may already have as many as 64,000 factory-type farms, compared to a U.S. total of nearly 18,800. Meat and dairy production have a direct impact on global climate change. Fully 18 percent of global greenhouse gas emissions stem from the livestock industry, according to the United Nations Food and Agriculture Organization. That's more than the entire world transportation sector. And in 2008, China surpassed the United States to become the world's leading emitter of carbon dioxide (CO2). Per capita CO2 emissions in China have more than doubled, from 2.1 tons of CO2 equivalent in 1990 to 5.1 tons today. As the country's farmed animal population expands, emissions from this sector will only rise. Animal waste is also a concern. 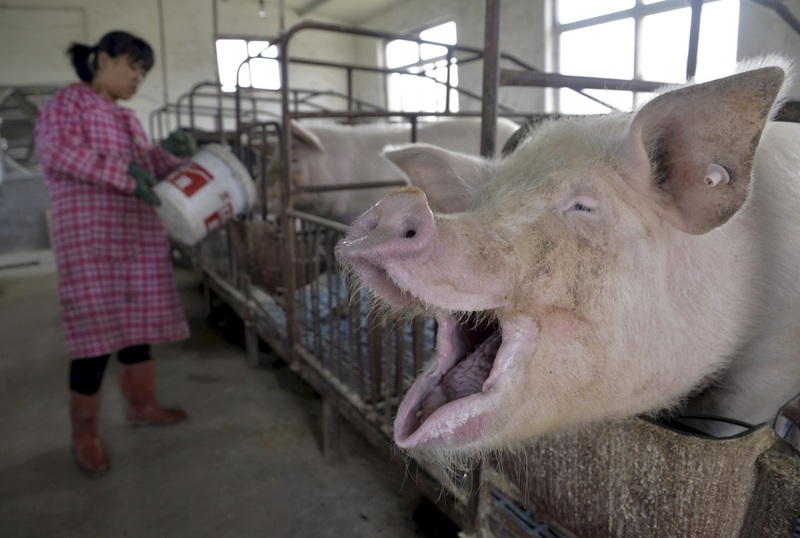 China's farmed animals produce 2.7 billion tons of manure every year, nearly three and a half times the industrial solid waste level. 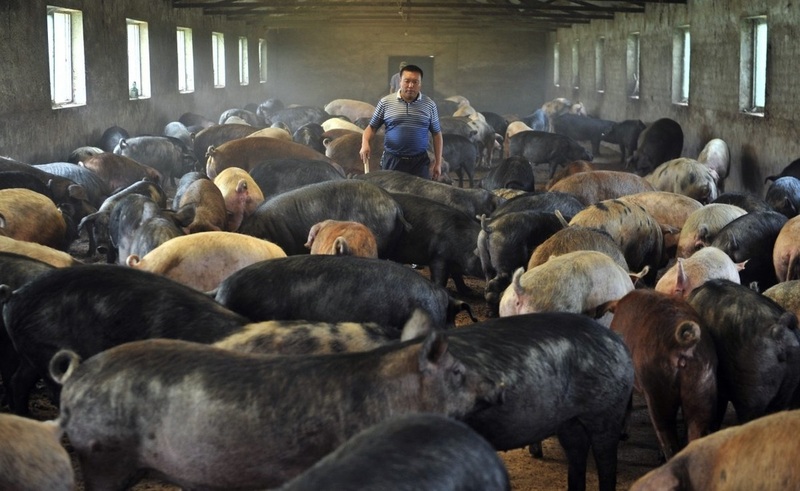 Xu Cheng, a professor at China Agricultural University, estimates that only 3 percent of China's large and medium-sized livestock operations have facilities to treat animal wastes. Runoff from livestock operations has created a large "dead zone" in the South China Sea that is virtually devoid of marine life. In northern China, overgrazing and overfarming lead to the loss of nearly a million acres (about 400,000 hectares) of grassland each year to desert. Data from China's Ministry of Health show that in the 1930s, 97 percent of calories in the average Chinese diet came from grains and vegetables, compared to only 63 percent in 2002. China's health profile is being reshaped in the U.S. image, and for the worse. A recent study by University of North Carolina nutrition professor Barry Popkin concluded that nearly one in four adults in China is overweight. Eighty percent of Chinese now die as a result of non-communicable diseases such as heart disease and cancer, often tied to diets high in animal fats and sugars. 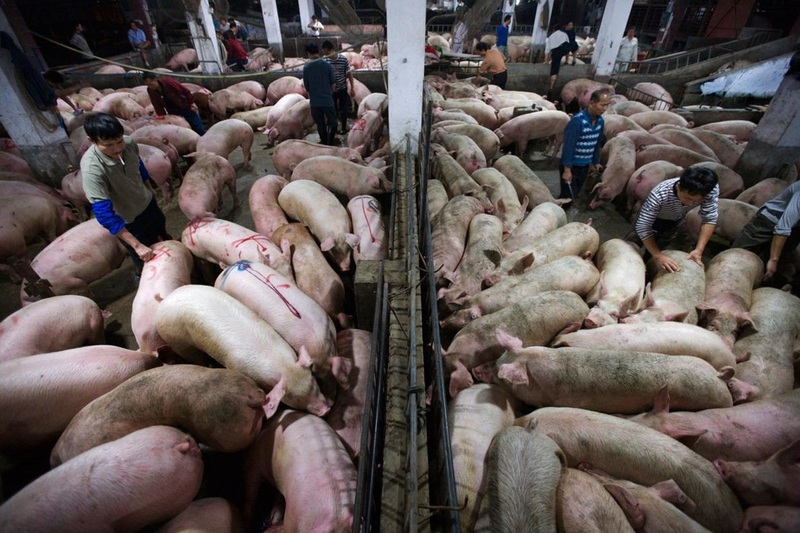 Other negative consequences of the industrialized-nation factory farm model are becoming embedded in China as well. 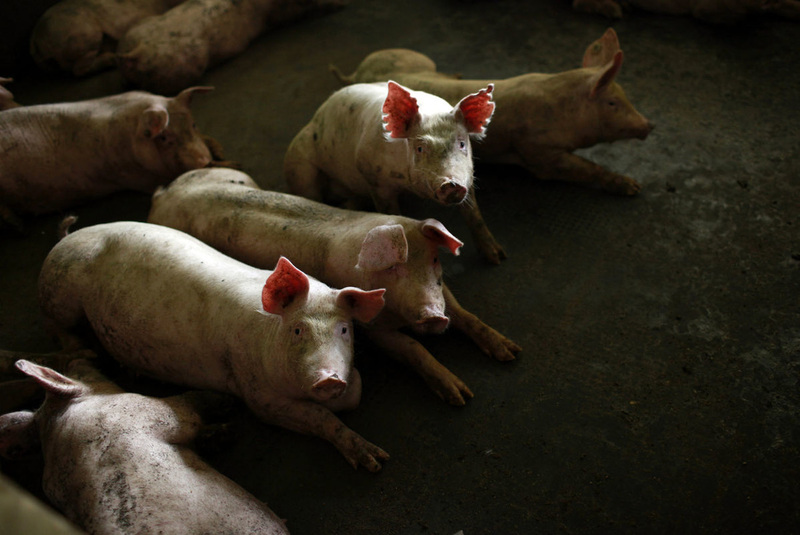 The World Health Organization warns that many "first-line" antibiotics, such as penicillin, are no longer effective against more than 90 percent of certain bacteria in Asia due to the drugs' overuse in farmed animals. Just before the Olympics, China's chief veterinarian in the Ministry of Agriculture, Jia Youling, indicated that some Chinese farmers were still using banned growth-enhancing drugs, food coloring, and other chemicals, while feed additives with high concentrations of metals were polluting water and crops. Incidences in China of "blue ear" disease, avian influenza, and SARS (severe acute respiratory syndrome), as well as the discovery of the industrial chemical melamine in domestically produced food and feed, have rattled food markets around the world. Indeed, food safety concerns led the U.S. Olympic Committee to accept a shipment from U.S. producer Tyson Foods of 25,000 pounds (11,334 kilograms) of beef, chicken, pork for U.S. athletes to eat during the Beijing Olympics. As demands for meat, milk, and rice-a Chinese dietary staple-grow, and as available land and water resources dwindle, China's government is looking abroad to ensure food security. It is not only accessing international food markets, but also looking to Africa, Latin America, and other parts of Asia for land on which to produce food for both people and livestock. In 2007, world grain prices shot up by 42 percent over 2006 levels, putting millions of already poor people at greater risk of hunger and malnutrition. While this phenomenon has many causes, one is the steady growth in demand for grain for feed. China's development is proceeding at a pace and scale without precedent in modern human history. Environmental, economic, public health, and animal welfare challenges that took decades to become obvious in the West require only years in China. Given these realities, will China be able to replicate the industrial animal production model, the costs of which are now being heavily scrutinized in the industrialized world? And more importantly, will it want to? "The present system of producing food animals in the United States is not sustainable," wrote Robert P. Martin, director of the Pew Commission on Industrial Farm Animal Production, in the group's final report. "[It] presents an unacceptable level of risk to public health and damage to the environment, as well as unnecessary harm to the animals raised for food." So far, the Chinese government's path seems set. But a small and growing number of non-governmental organizations, academics, and even policymakers in the country are raising questions. To them, food quality, not quantity, is what matters, along with food safety, sustainability, environmental protection, and animal welfare. China's government and people can-and should-undertake a critical examination of the consequences of industrial animal agriculture, before it's too late for a more sustainable, humane, and secure system to take root. Mia MacDonald is a senior fellow at the Worldwatch Institute and the executive director of Brighter Green, a public policy "action tank" working at the intersection of environment, animals, and global development. Brighter Green recently published a study on the issues raised in this piece, Skillful Means: The Challenges of China's Encounter with Factory Farming (also available in Chinese). 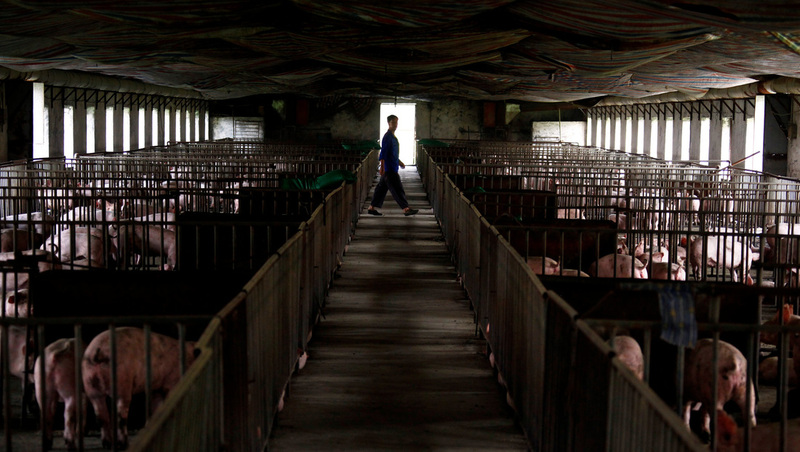 Workers process pig parts at the Shuanghui Group facilities in Louhe, Henan in central China.